Picture of the Week – Fish In Show Business! Question: Is Fish Window Cleaning in Show Business? Window cleaning is definitely not “working in the circus“ but it is tough enough that our commercial customers use professionals to get their windows cleaned. Whether they own a store in a strip mall or they manage a large landmark building, business owners understand that clean windows project a healthy, strong and viable first impression…. And customers do notice! That’s why they call Fish Window Cleaning to clean their windows on a regular basis! Most stores and restaurants hire FISH to clean their windows every 2 or 4 weeks. We clean the inside and the outside and remove all fingerprints, smudges, and cobwebs, giving your customers a great impression. Large jobs like the one in this picture are usually scheduled quarterly or semi-annually, depending on how dirty the glass gets. Also, if you have scratched glass FISH can help you too! 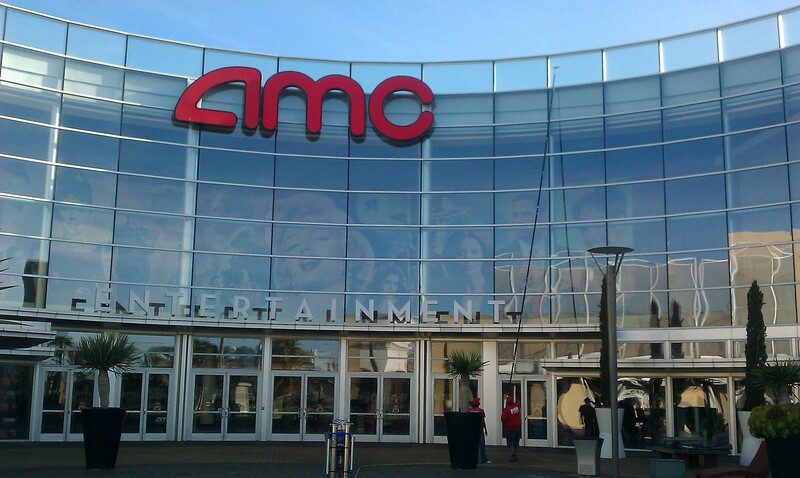 In this picture, Fish Window Cleaning – Los Angeles South Bay window cleaners, Silvester Martinez and Jaime Rodriguez, use an Unger CarbonTec water-fed pole to clean the AMC Del Amo Theaters in Torrance California. As you can see, even at 50 feet up, the glass sparkles and allows those famous faces to shine! We absolutely agree… There’s no business like show business! Fish Window Cleaning is an National Franchise with 190+ franchisees located throughout the United States. FWC corporate headquarters are located in St. Louis, MO. Rain water is about as pure as water gets. There are little or no impurities and, by itself, does not cause your windows to look dirty, spotted or streaked. On clean glass the rain water just runs right off, spot free! 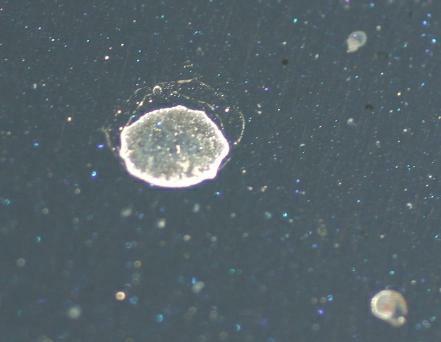 Simply put, the existing debris catches the new debris and it builds up. So, when there’s rain in the forecast, it a good thing to have have Fish Window Cleaning clean your windows. If rain is in the forecast, it’s just sprinkling or your windows are covered by an overhang or awnings – we’ll make your windows sparkle just like we do when it’s sunny. If we do clean your windows and it rains within 48 hours AND your windows do spot or streak, call us and we’ll touch them up – Free of Charge– as soon as possible. 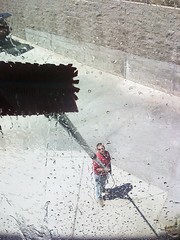 Kevin Strom of Fish Window Cleaning – Los Angeles South Bay uses a water-fed pole to clean high windows in Redondo Beach. What is a Water-Fed Pole? A water-fed pole or “system” uses purified water in conjunction with a tool to clean windows, building surfaces, vinyl awnings, truck trailers, cars, etc. The “water-fed” pole uses regular tap water that is then hooked up to our mobile de-ionized water filtration unit. The de-ionizer is used to reduce calcium, salt and other particles found in regular tap water from about 400 particles per million (ppm) to about 1 ppm – creating essentially “pure” water. For reference, Arrowhead bottled water, while refreshing and delicious, contains about 225 ppm and is perfectly safe to drink, but if you’ve ever let some evaporate on a piece of glass, you’ll notice that the water does leave some “residue” spots. De-ionized water with less that 20 ppm leaves virtualy no residue – i.e. NO SPOTS! The water is pumped from the de-ionized unit, up through the brush (hence the name “water-fed”) and squirted onto the glass while the cleaner uses the brush to agitate the dirt located on the window. Once he’s scrubbed the entire piece of glass with the brush, the “pure” water is used to rinse the particles away and the window dries spot free! Water-fed pole techniques are very important to Fish Window Cleaning’s success, since we clean a number of buildings and homes where its simply impractical (and dangerous) to use a ladder to clean with a traditional mop and squeegee. Some homes in the Los Angeles South Bay (especially in Manhattan Beach, Hermosa Beach and Redondo Beach) are built so close to their neighbors that there’s literally no other way to reach the windows safely. Thank goodness for technology! Using a water-fed pole is an excellent way to safely and efficiently clean difficult to reach windows – but traditional window cleaning techniques should always be considered first, before resorting to advanced technology. Always make sure that your window cleaner has been properly trained on the proper use and maintenance of the equipment, how frequently they use this equipment/technique and, more importantly, why the pole is being used. Some window cleaners tend to “overuse” water-fed poles just to gain speed rather than providing the “best” solution for their customers’ needs. When asked about why they are using a water-fed pole, your window cleaner must have an answer better than “it’s faster this way“. Remember: You are the consumer and you have the right to ask “why”! Click Here or Call 310-973-3474 for a Free Written Estimate. We’ll make your windows SPARKLE! 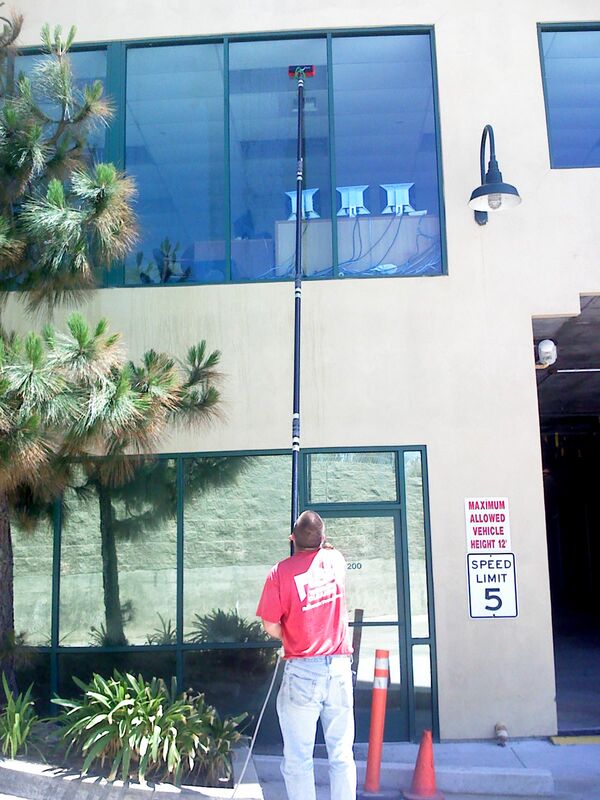 By FishSouthBay  Posted in Cleaning Tips, Picture of the Week, Window Cleaning Info	 Tagged "Commercial Windows", "Fish Window Cleaning", "Manhattan Beach", "Redondo Beach", "Water-fed Pole", "Window Cleaning"